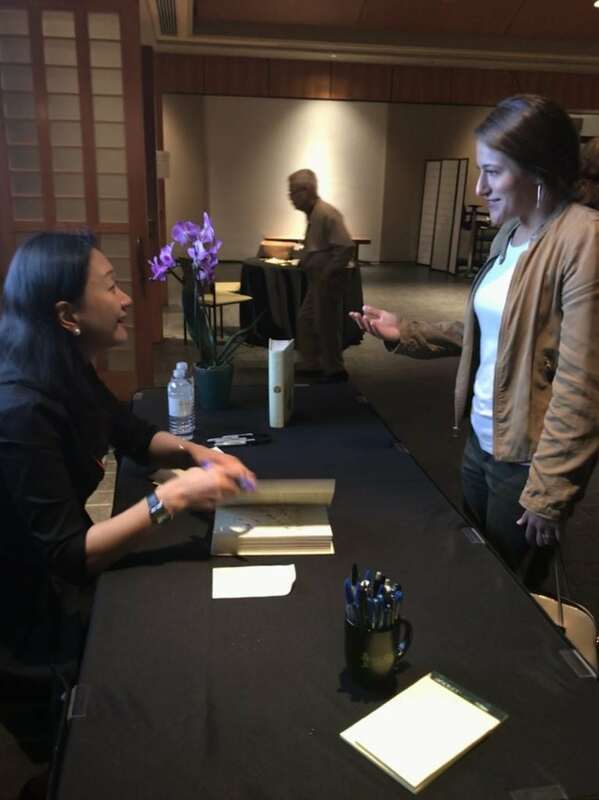 This week, I got a chance to meet Korean-American author Min Jin Lee. She’s on tour for her recent smash hit, Pachinko, and I was ecstatic at the chance to hear her speak and participate in a Q&A and book signing at Morikami Museum and Japanese Gardens. 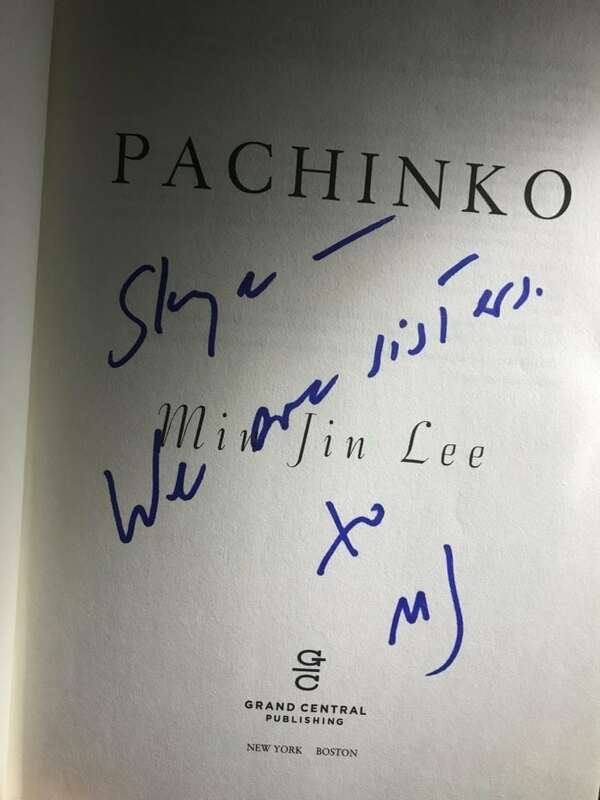 Meeting Min Jin Lee, author of best-selling novel Pachinko. Pachinko was a finalist for the National Book Award and was named one of The 10 Best Books of 2017 by The New York Times. I received a copy through my beloved Book of the Month box (click here to get your first month free) and, when I saw that Lee was coming to town, just had to have the author’s signature gracing its pages. Lee began her talk with a brief history of George Morikami, explaining to the crowd filling the Morikami Theater that she feels a sense of fidelity to him. It was her first visit to Palm Beach and she was moved to think that she and Morikami had seen the same moons, breathed the same South Florida air, and felt the same strong emotions, both as humans and as immigrants to America. Lee’s love for her adopted home country brought her to tears, and she took time to pay homage to the legacy left behind by trailblazers like Morikami. Lee arrived to New York in 1976, at just 7 years old. She suspects now that she fought through learning disabilities in school, though she was never diagnosed. She practically didn’t speak until high school–but did plenty of reading. Her obsession with Sinclair Lewis led her to apply to Yale, where she flourished. Choosing a major in History piqued her interest in the lives of the poor, the ordinary, and the destitute–people don’t leave documents behind. After working as a lawyer for two years, she left the field behind to become a writer. Her first novel, Motherland, was written in 1989–and, in her words, it was terrible. It wasn’t until she moved to Japan for her husband’s job and spent time chatting with hundreds of Koreans living there that she understood what was wrong with the book. Motherland was “a victim’s treatise,” but through her conversations with Koreans, she began to understand that they didn’t see themselves as victims. The book was reborn as Pachinko and, in 2016, finally sold. Lee’s profound gratitude for her status as an American citizen should be an inspiration to all of us, especially in today’s political climate. Following a short reading from Pachinko, Lee held a rousing Q&A session, which gave her time to cover everything from her husband’s ethnicity (he’s half Japanese) to the ins and outs of the game of pachinko. I found it fascinating that pachinko is a ¥25 trillion industry in Japan–twice the size of its auto export industry–and yet Japanese society looks down its nose at the game. The irony both frustrates and fascinates Lee. Lee has been on tour for the past year and a half and will be on tour for the next six months. If she’s coming to speak anywhere near you, I’d highly recommend grabbing a copy of the book and going to hear her speak. Her kind demeanor is both inspiring and reassuring, and you’ll leave with a better understanding of both race relations and the life of a writer. My newly signed copy of Pachinko.